Today marks the eighth day of CBS and Time Warner Cable's ongoing feud over cash money. It's annoying. It's frustrating and damn it, the PGA Championship is going on and there's a new episode of Ray Donovan this Sunday! Here's how to get around the blackout if you're in an affected market. The easiest and quickest solution to getting CBS back is buying an antennae. 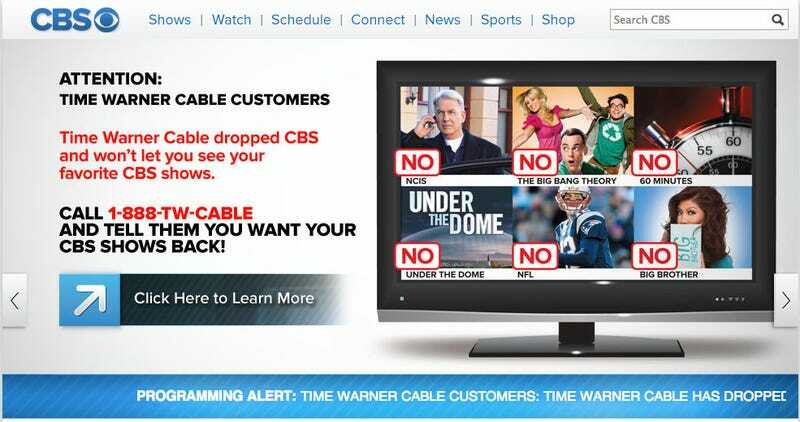 After all, CBS does blast its programming out for free over the air. Setting up an antennae is simple and just about anyone can figure it out. You don't need anything crazy expensive either. Check Amazon or your local electronics shop. And depending on where you live, you might not get the best of signals anyway. Aereo probably won't roll out to Dallas or LA before the blackout ends, but those in New York can take advantage of the web TV service now. Sign up and get a free month. Who knows when the blackout will end. You can always use a VPN or proxy service to conceal your Time Warner Cable connection from CBS.com or Sho.com, too. It can get a little tricky if you've never set one of these up before, but don't worry, we have you covered. Oh, and then check out Lifehacker's picks for the best VPN service providers here. Once you've got your VPN set up, you can freely use the CBS and Showtime apps to stream from your mobile device. And if you have an Apple TV and the accompanying digital AV adapter, you can mirror everything to your TV. If you really need to watch grown men run around and pat each other on the bum, then go to your local "sports bar." But if you'd rather watch the PGA Championships in the comfort of your own home in your underwear, the PGA is livestreaming the tournament. If, for some reason, you can't get any of the above to work, then go to someone else's house. Or, go outside and enjoy what's left of summer. It's just TV.